A teenager who drove into a boy in a hit-and-run crash told police he planned to hand himself in “after watching Love Island”, a court heard. 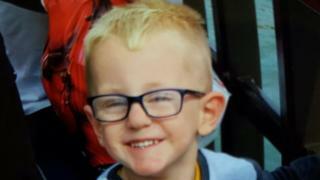 Leo Durrington, three, was flung 17 metres [55 ft] through the air when he was hit by a stolen Ford Transit, in Leigh, Greater Manchester, on Tuesday. At Wigan Youth Court, the teenager admitted causing serious injury by dangerous driving. Another boy, 15, admitted a charge of being carried in a stolen vehicle. The court heard a van was stolen on Monday and the 16-year-old was spotted driving it at about 10:00 the next day in Leigh. It was followed by a police car and “reacted” by accelerating up to 50 or 60 mph and overtaking over vehicles, said James Gore, prosecuting. As the van made a right turn it left the road and mounted the pavement. The van failed to stop and was later found abandoned, the court heard. The 15-year-old boy handed himself in to police that evening after contacting his solicitor. About two hours later a police officer went to the 16-year-old’s home to arrest him. The defendant told the officer: “It’s all right, I was going to hand myself in after watching Love Island,” the court heard. He later told police he did not see the youngster or his mother when he drove away. Greater Manchester Police said Leo was still in a critical condition in hospital. The older boy admitted failing to stop for police after a collision, driving without a licence and insurance and a handling a stolen vehicle. Neither of the teenagers can be named because of their ages. The 16-year-old had already been due in court on 15 November, accused of other motoring offences, before the crash involving the child, the court heard. Both boys will be sentenced on that date. Lawyers said the case cannot be transferred to the crown court so the maximum sentence the 16-year-old can face is two years’ detention.